The blue market cards can be played exactly once as an action in a later turn of the player who draws it. The purple statue cards and the green decoration cards will earn you points at the end of the game. Example: This four-stone ship was sailed to the market. 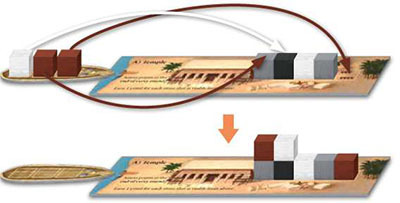 The white player can first take a card and she selects the sail card. Then the brown player chooses the statue card. Then the gray player chooses the lever card. By the end, all of the stones that were on the ship are returned to the quarry. For each stone delivered here, the owner of the stone earns points immediately. Place the stone on the next free space in the pyramid. Stones are placed column by column. Placement of the stones begins at the top left until the column is full. Continue to the center column, starting again at the top. When the first level (3x3 stones) is full, continue building in the second level, as shown in the illustration. In the second level, start once again at the top left. The second level only includes 2x2 stones, however. When the second level is full, continue building in the third level, which only consists of one single stone. Each stone that you place yields the number of points indicated on the space. The values of the spaces in the second and third levels are indicated on the right side of the board. Once the pyramid is completely built, each additional stone delivered to the pyramid yields 1 point. Place these stones at the right edge of the pyramid board. /Example: The illustration above shows how a completed pyramid (consisting of 3 levels) can look at the end. For each stone delivered here, the owner of the stone earns points at the end of the round if the stone is visible from above. Place the stone on the next free space in the temple. Placement of the stones begins from the left, until the first level is full. With 3 and 4 players, all 5 spaces of the temple are covered. With 2 players, just the first 4 spaces are covered. When the first level is full, continue to the second level, beginning again from the left. The stones on the first level are covered over in the process, and so on with additional levels. There is no height limit. Example: This three-stone ship was sailed to the temple. The first brown stone goes on the last free space on the lowest level. The second brown stone goes on the first space on the second level. The white stone goes on the second space on the second level. For each stone delivered here, the owner of the stone earns points at theend of the game. Stones are placed column by column. Placement of the stones begins at the top left until the column is full. Then continue to the next column, starting again from the top, and so on. The burial chamber is unrestricted in the rightward direction. In other words, there can be as many columns as you like, even if you have to go to the end of the board. At the end of the game, points are earned as follows: Each area consisting of one stone or more than one connected stones of a single color yields a certain number of points depending on the number of stones. Connected stones must be touching along at least one side. Stones touching only diagonally at corners are not connected. In areas with more than 5 connected stones, each additional connected stone yields an additional 2 points. Important: Each player can get points for more than one "field" of connected stones. So don't just add up points for the largest field for one player! Example: This four-stone ship was sailed to the burial chamber. The stones are unloaded in order and placed on the burial chamber column by column starting from the top left. 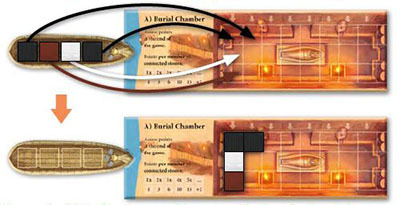 Example: In a game with four players, the burial chamber could look as shown in the illustration above. The white player gets 3 points for her field consisting of 2 stones. Black gets 1 point for his 1-stone field. Brown gets 6 points for her field of 3 stones and 1 point for her 1-stone field. Gray gets 15 + 2 = 17 points for his field consisting of 6 stones. For the stones delivered here, the players earn points at the end of the game. Place each stone delivered here on the space matching your color. In that way, you will create a stacked tower of your stones. Each player will be building his or her own obelisk. Add up the points at the end of the game - with the tallest obelisk getting the most points, of course. 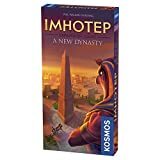 The player with the tallest obelisk gets 10 points. The person with the second-tallest obelisk gets 1 point. The player with the tallest obelisk gets 12 points. The player with the second-tallest obelisk gets 6 points. The player with the third-tallest obelisk gets 1 point. The player with the tallest obelisk gets 15 points. The player with the second-tallest obelisk gets 10 points. The player with the third-tallest obelisk gets 5 points. The player with the fourth-tallest obelisk gets 1 point. You must have delivered at least 1 stone to the obelisks to participate in this point assessment. In case of a tie, divide the total points among the number of players who tied. Every player involved in the tie shares in the divided-up point total rounded down to the nearest whole number. Example: In a four-person game, the black player ends up with an obelisk that is 3 stones tall. The white player has a 4-stone tower. The brown player has no stones at all. The gray player has 3 stones. 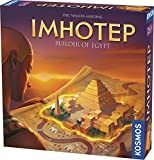 That means that the white player gets 15 points. The black and gray players share second and third places. They both get (10 + 5) / 2 = 7.5 points, which when rounded down yields 7 points for each player. Brown gets no points, because he did not deliver any stones at all to the obelisks.